In their ongoing efforts to provide evidence for common-ancestor evolution, paleontologists and evolutionary biologists have something to tell all y'all: it's a squid. Yep, a well-preserved fossil that was dated at several million Darwin years is the same as modern squid. That is, a living fossil. Living fossils are annoying to evolutionists because there is no sign of something becoming something else over alleged long ages. Still, these owlhoots commence to doing misleading storytelling. They include definitive scientific term probably, and use a passel of assumptions. Circular reasoning is helpful, too. Problem is, Darwinoids grab this stuff as actual science and then spread it around. The logical conclusion is that such evolution did not, does not happen, and the evidence shows special creation instead. 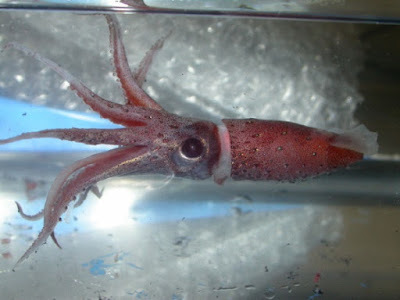 A recent science news article sheds light on the amazing squid, but definitely not on its supposed evolution or origin. Creation scientists maintain squid have always been squid, and science bears this out with a new and highly detailed squid fossil. The article states the fossil is "exceptionally preserved." Clearly the reason for the exceptional formation and preservation of the squid's fragile body in this fossil is due to an obvious rapid and catastrophic burial. A flood of biblical proportions comes to mind. To read the rest of this short article, click on "The Fascinating Squid".